The Samsung Galaxy A9 (2018) smartphone was launched on 11 October 2018. These phones are given to speed up RAM up to 8 GB. 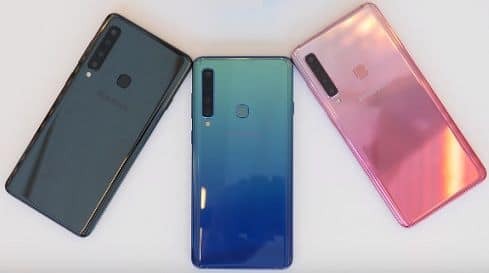 The new Galaxy A9 handset has been made part of the company’s Samsung Galaxy A7 (2018) league, which is the company’s first three rear cameras. This smartphone is an upgrade to the Samsung Galaxy A9, launched in 2015. The most important feature of Samsung’s smartphone is the four camera rear camera setup. Another important feature of the Samsung Galaxy A9 (2018) is the Infiniti display, which has an aspect ratio of 18.5: 9. The company has claimed to have a 3D Glass Curve back in the phone. It will be made available in November. This phone will be made available in Bubblegum Pink, Cavity Black, and Lemonade Blue. Samsung Galaxy A9 (2018) is priced 599 euros and 549 GBP. No information was given regarding the launch of the Samsung Galaxy A9 (2018) in India in the launch event. Samsung Galaxy A9 (2018) has inbuilt storage of 128 GB. If needed, MicroSD card up to 512 GB can be used. The highest clock speed is 2.2 GHz. There will be 6 GB and 8 GB RAM options for Jugalbandi. It has a 6.3-inch full-HD + (1080×2280 pixels) infinity display, with super AMOLED panels. The handset has a 3800 mAh battery which supports fast charging. The phone comes with Face Unlock, Bixby Assistant and Samsung Pay. Qualcomm Snapdragon 660 processor has been given in the handset. The phone has a 24-megapixel primary camera with F / 1.7 archer. The second 10-megapixel telephoto camera is. It is equipped with 2x optical zoom and F / 2.4 aperture. It has an 8-megapixel ultra-wide camera that comes with 120-degree lens and F / 2.4 aperture. In the end, there is a 5-megapixel depth camera whose extraction is F / 2.2. Samsung Galaxy A9 (2018) has a 24-megapixel front camera with an F / 2.0 aperture for selfie enthusiasts. Samsung Galaxy A9 (2018) is the world’s first smartphone to come up with a four rear camera in a way. In low light, the primary camera pixels make four pixels one by binding. Accelerometer, gyroscope, ambient light sensor magnetometer, proximity sensor, and RGB light sensor are part of this phone. The connectivity features include 4G VoLTE, Wi-Fi 802.11 AC, Bluetooth 5.0, USB Type-C, NFC and 3.5mm headphone jack.